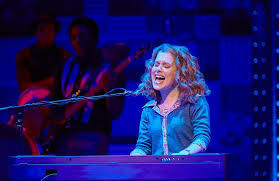 Currently on a UK tour, Beautiful The Carole King Musical, tells the story of the American singer songwriter from her earliest days writing the music for the lyrics written by her husband, Gerry Goffin, through their often turbulent marriage and subsequent divorce right up to King’s creation of the seminal album, Tapestry. 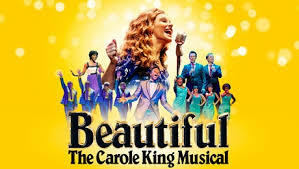 Using both King and Goffin’s music as well as that made by friends and rivals Cynthia Weil and Barry Mann, Beautiful is as much Carole King’s story as a history of American popular music. In fact it is amazing to think of the songs that were written by these two writing partnerships; from It Might As Well Rain In September, Up On The Roof, Will You Still Love Me Tomorrow and You’ve Lost That Lovin’ Feeling the hits just keep coming, hitting the audience like the train in The Locomation, another Goffin King tune, recorded by their babysitter, Little Eva. The cast, led by a fabulously talented Bronte Barbe as Carole King, treat the songs with great performances that really showcase the music created. On occasion the performances on the night veered slightly too much towards a musical theatre style with, unfortunately, the performance of The Locomotion falling a bit flat on the night I saw it, but mostly the songs were spot on. The three other leads, Kane Oliver Parry (Gerry Goffin), Amy Ellen Richardson (Cynthia Weil) and Matthew Gonsales (Barry Mann), really linked superbly well with Barbe, showing off as a perfectly in tune ensemble, with art imitating life as each player inspired the others to wonderful performances as in real life King and Goffin inspired Mann and Weil to more and more hit records. Add to this the performance of the support cast in bringing to life the acts, such as The Drifters, The Shirelles, The Righteous Brothers and Neil Sedaka, who performed and made famous the songs written by these two pairs. If there is a slight criticism of the story the influence and involvement in the creation of Tapestry of, predominantly, James Taylor but also Joni Mitchell isn’t touched at all; but I’m sure there are good reasons for this. After all, with King’s involvement in creating the story, it is her prerogative of what should be told. The story culminates with King’s triumphant concert at the Carnegie Hall in her home city of New York; which is a fitting finale for what is a triumph of musical theatre. Amazing performances of some of the greatest songs ever written fit the theatrical stage perfectly. If this show is in a town near you I urge you to go along. You certainly will feel the earth move beneath your feet! We saw it early on in the tour at Bradford. A friend of the family plays Carole’s mother. Thoroughly enjoyed it and was surprised by the number of songs she wrote, I’m not really a big fan so wasn’t really aware of this side of her life. I was impressed with the whole cast in honesty, although of course Carole (and her mother !) stole it. A great uplifting show, a real happy way to spend the evening. I must buy Tapestry at some point.